Lindsay Pascoe grew up in the artsy town of Ojai, California surrounded by mountains, horses and citrus groves. She started drawing as soon as she could hold a pencil and from her first riding lesson, all she wanted to draw was horses. At six years of age, she won Best of Show for her pencil sketch of a jumping horse at the Ventura County Fair. She has since experimented with different mediums including graphite, acrylic, oils, and sculpture. After high school she attended California Polytechnic State University, San Luis Obispo, and received a bachelor’s degree in Animal Science with a minor in Agriculture Business. While in San Luis Obispo, she met her husband, Keith Pascoe. 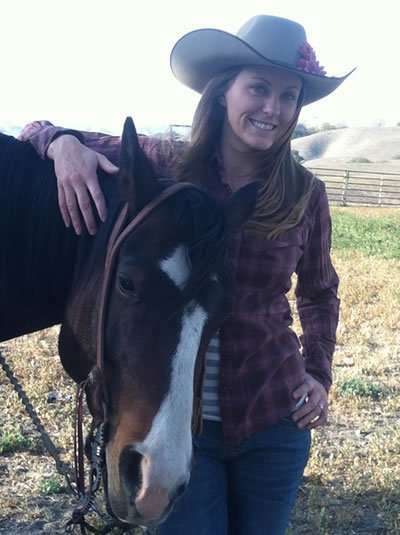 Keith, who grew up working on ranches, opened her eyes to the world of ranching. Much of her art has been inspired by his experiences and stories of working on cattle ranches. She is currently attaining her degree in Dental Hygiene. Today, Keith and Lindsay live on the Jack Ranch in Cholame Valley, riding horses and training cow dogs. Along with western art, she creates portraits of dogs and horses on commission. Lindsay continually strives to perfect the portrayal of the real modern cowboy, the relationship with his animals, and the western lifestyle.